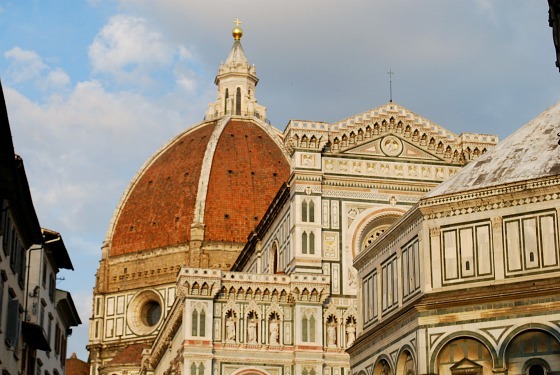 The Florence Duomo’s most striking feature is the Dome on the top and for a fee, you can climb right up to the viewing platform for tremendous views of Florence. There are actually 2 domes here, the structure you see from the inside and the outer shell you see on the outside. Most of the route to the top takes place in between the two domes. 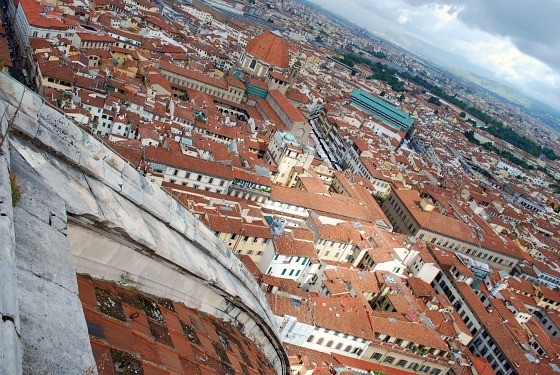 This is our virtual trip up the historic dome. 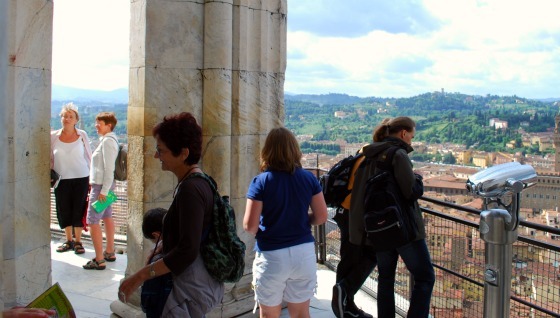 Your journey starts in Piazza del Duomo where you get a great view of the structure you’re about to ascend. 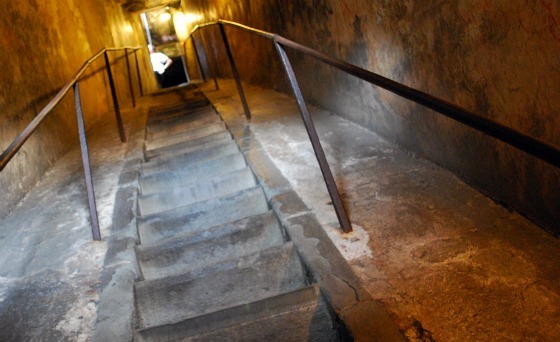 Do not take the trip up the dome lightly – it involves hundreds of stone steps, wooden walkways and even a ladder! The entrance to the dome is at it the base of the cathedral on the left hand side of the picture above. The entrance is clearly marked, but occasionally the line for those wishing to enter the Duomo itself overlaps, so be sure you’re in the right queue. The dome is open Monday to Saturday from 8.30am, closing at 7pm from Monday to Friday and at 5.40pm on Saturday. 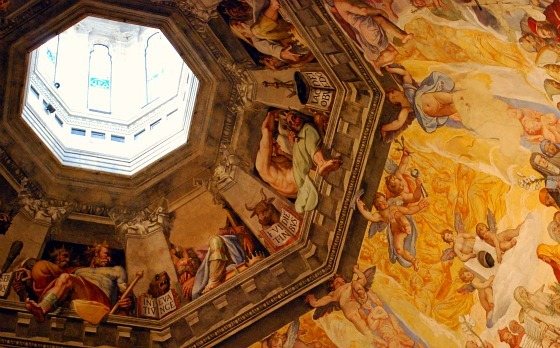 Adult admission to the dome is included in the Duomo Combination Ticket at 15 Euros (2016 prices). The first part of the climb involves a series of stone steps. 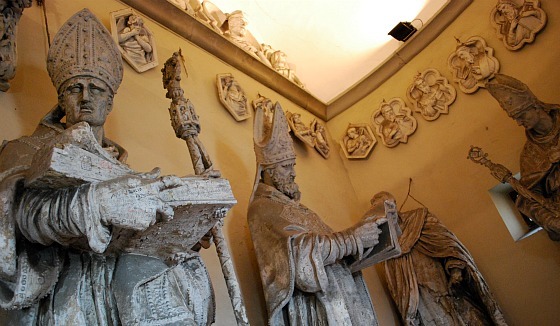 When you reach the height of the base of the dome itself, there is a small room with a display of statues (pictured above). At this point, you will probably need a rest before attempting the rest of the climb! Next, you get to walk around part of the walkway on the inside of the cathedral which gives you a spectacular view of the painted ceiling. The light comes from the natural light ‘lantern’ on this photo, which is where you are heading next. From this point on, your journey takes place in between the two domes of the cathedral – the inner dome with the painted ceiling and the tiled outer dome that you see outside. There are spiral steps, zig-zag walkways and finally the flight of steps you see above which take you to a small ladder. When you get to the top of the ladder, this is the sight that greets you! The platform at the top of the dome, runs around the stone ‘lantern’ and although it’s not large, you do feel entirely safe. This is just part of the spectacular view to enjoy from the top of the dome. 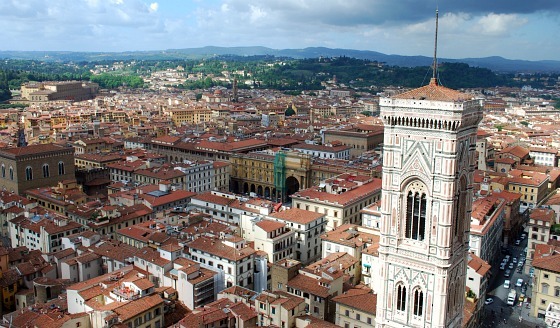 You can see for miles around and you are able to walk around the entire platform for 360 degree views of Florence and the surrounding Tuscan hills.